● Blood Pressure can determine heart function and peripheral vascular resistance. ● Blood Pressure is also an important part of diagnosing diseases, observing changes in conditions, and judging the effects of treatment. ● HYLOGY is a globally renowned brand, our products have CE/FDA certification, the brand you can trusted! ● HYLOGY Blood Pressure Monitor with self-designed biotechnology high-precision sensor technology German chip. (1) High blood pressure: Under the premise of not using antihypertensive drugs, systolic blood pressure≥140mmHg and/or diastolic blood pressure≥90mmHg in adults over 18 years of age. (2) Hypotension: Blood pressure lower than 90/60 mmHg. ✪ Bandages should be tied to the left hand and can’t be tied to the right hand, which will affect the accuracy of the data. ✪ Sitting posture and sleeping position are the best. Do not stand to measure blood pressure. This will increase your blood pressure. ✪ When using the blood pressure monitor, full body natural relaxation, don’t talk, eat, drink water and so on. We provide 24-month warranty and professional customer service support. If you have any questions or problems with the product, please contact us on Amazon at the first time. Wish you have a satisfied and happy shopping experience! 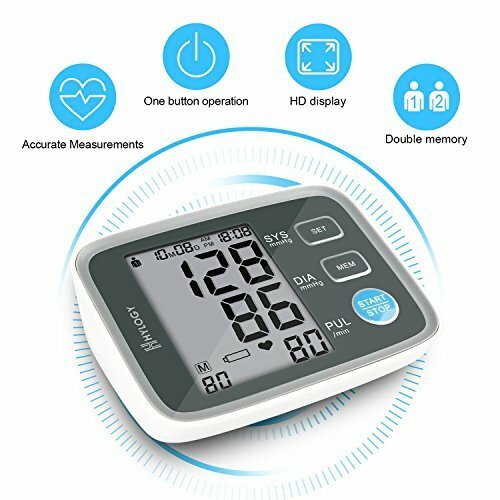 ❤AUTHORITY & ACCURATE – HYLOGY Blood Pressure Monitor with self-designed biotechnology high-precision sensor technology German chip. The Pressure accuracy is ±3 mmHg, and Pulse accuracy of reading is ±5%. Pass CE certificate and FDA approved. With advanced technology by doctor recommended for home use. ❤BIG MEMORY STORAGE – 2 Users Capablity * 90 Measurement Memory with date & time stamp. Randomly Switch between 2 users to store measurements separately. Automatically access your records at any time to track your progress – Great for doctor visits. ❤WIDE-RANGE CUFF – Fits standard and large adult arms from 22cm(8.5 inches)-42cm(16.5 inches). Integrated with hook-and-loop fasteners, its humanized design offers precision and comfort to you during measurement. ❤EASY TO READ DISPLAY – Extra-large backlit LCD ensures clear numbers. Displayed measurements include: systolic pressure, diastolic pressure, pulse rate, date, time, and user. Energe saving, automatic shutdown in one minute when there is no operation. ❤TWO-YEAR GUARANTEE – Package include 1 x HYLOGY Upper Arm Blood Pressure Monitor, 1 x Cuff, 1 x Instruction Manual, 24 Months x Warranty Card. We stand behind our products with Excellent Customer Service and an industry leading 2-year Guarantee.